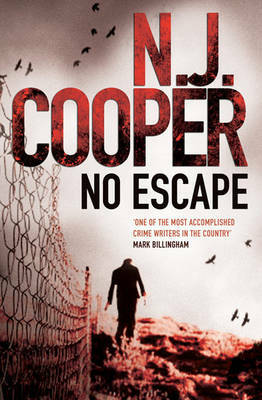 NO ESCAPE is the first of a series by N J Cooper, previously known as Natasha Cooper, author of the Trish McGuire books. Like the earlier books, NO ESCAPE has an appealing female protagonist - this time a forensic psychologist called Karen Taylor. Karen is staying rent-free in her grandmother's ramshackle holiday home on the Isle of Wight while she works on her research project to identify and characterise "dangerous severe personality disorder" (DSPD). Her task is to interview Spike Falconer, incarcerated in Parkhurst prison for shooting a family of four to death some years previously. Karen and her autocratic boss Max Pitton think that based on his history he may have DSPD, which if so would be additional evidence that the condition exists. As Karen gets to know Spike via her prison interviews, she becomes unsure whether he really did commit the murders for which he has been convicted. At the same time, a policeman on the island, DCI Charlie Trench, tells her of some unsolved crimes from years back. Charlie would like to nail Spike for these murders too, but Karen does not think they fit with what she is learning about Spike. Part of this pacy novel is a straight "whodunit" - if Spike did not commit the crimes, who did? A crisis occurs when Spike escapes from prison accompanied by Jim, a guard he's befriended, and takes a young girl hostage, an event both resolved by Karen and one which makes her even more sure that nothing adds up about the strange young man she's investigating. The book is also a story about Karen's journey to self-confidence. She's experienced a traumatic event in her own past, which we come to learn about, and as a result is reluctant to trust anyone - either a partner or a colleague. How she learns to overcome her own fears and demons in the light of police hostility to her views, bossiness from Max Pitton, her encounters with Spike's family and her wavering over her attraction both to Charlie Trench and her current lover, heart surgeon Will Hawkins, all take place against the increasingly tense backdrop of threatened violence and instability. As well as being a satisfying mystery novel, I liked way in which Karen develops from being rather weedy at the start of the book, to capable self-assurance as she's increasingly threatened by unknown forces.